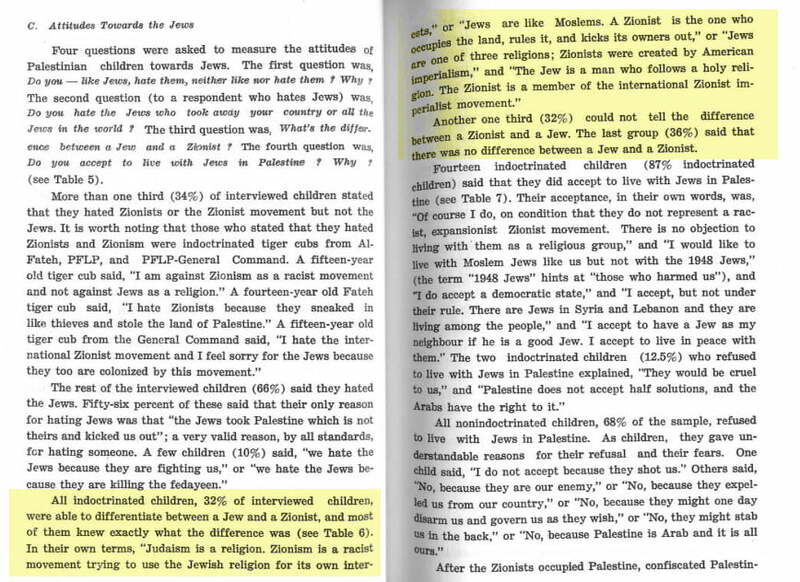 In 1970, the PLO’s Bassem Sirhan wrote Palestinian children: “The generation of liberation.” A study of the thoughts, feelings and attitudes of palestinian Arab children of the day, it provides a fascinating and disturbing glimpse into the culture of martyrdom fostered from a young age. The entire thing is not all that long, so I encourage you to read it here for yourselves. But for me, one part stands out as a huge own goal. Yet on the page before, Sirhan makes a telling statement. He is basically acknowledging Jewish history and admitting the yearning for a return to Zion is an integral part of Jewish identity (as opposed to being an artificial construct or American imperialism hijacking Judaism). Recognizing the Jewish state implies recognition of a Jewish people and recognition of its right to self-determination. Those who assert this right also assert that the territory historically associated with this right of self-determination (i.e., the self-determination unit) is all of Historic Palestine. 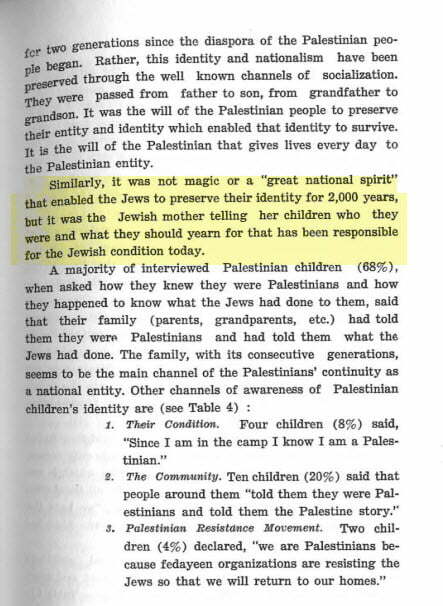 Therefore, recognition of the Jewish people and their right of self-determination may lend credence to the Jewish people’s claim to all of Historic Palestine. But as Sirhan’s slip of the proverbial tongue shows, they know the truth, as inconvenient as it is to their entire cause.